What is MOFLON Products' Unique ID? 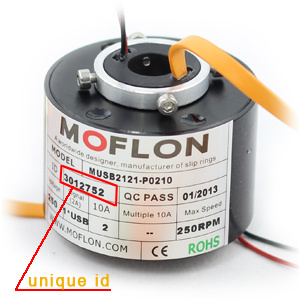 MOFLON supply a unique ID for each slip ring before leaving factory, through the unique ID, you can query if it is manufactured by MOFLON, you also query the test reports, the date of assembly and other information. How to Validated Unique ID? Slip Rings with unique ID must be directly purchased from MOFLON or MOFLON Sales Representative, How to validated the unique id? First,Please input the unique Id and click "Query", then you can see the detail information list. if ID is not correct, you can see the wrong message.